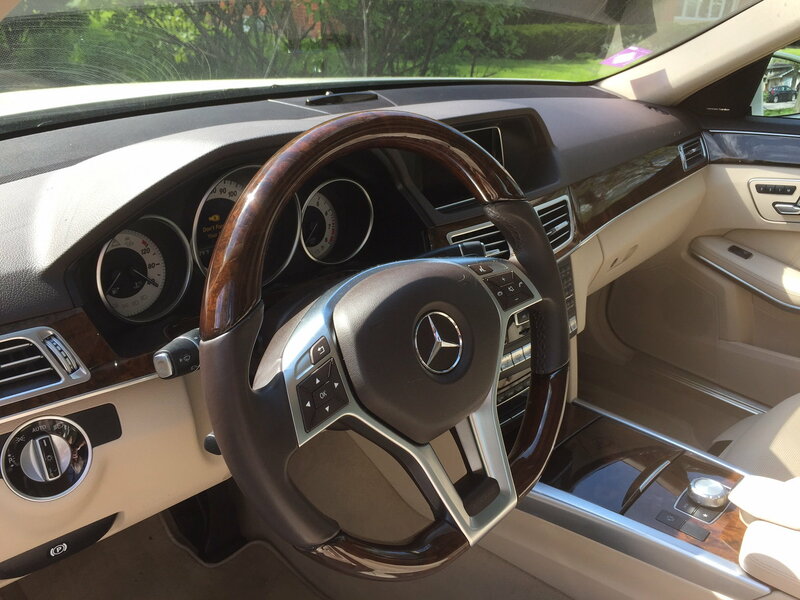 I have the (code 314) Sport Leather Steering Wheel with Trim insert... the one everybody wants, and for good reason.. It's stylish, and feels great. I like the flat-bottom design, the chrome spokes, and especially the handsome Burled Walnut trim inserts top and bottom. But, you should be aware all the pluses come with one minus... that bright chrome spoke assembly (the area above the buttons) casts one sunlight glare after another. It's very distracting while driving, because the curve of the trim behind the airbag ensures that the glare seems to hit directly in the face/eyes, regardless of sun angle. Live with this wheel on just one, bright sunny day, and you will realize I'm not joking about the glare. There's so much glare, I've thought about removing the chrome trim and spraying it with a flat-clear lacquer to tone it down. But that sounds too permanent to me. Meanwhile, I've covered the chrome along the top edge with Magic Transparent Tape. It cuts the glare completely, but the tape is not flexible, so has to be installed in pieces... so it looks ugly. 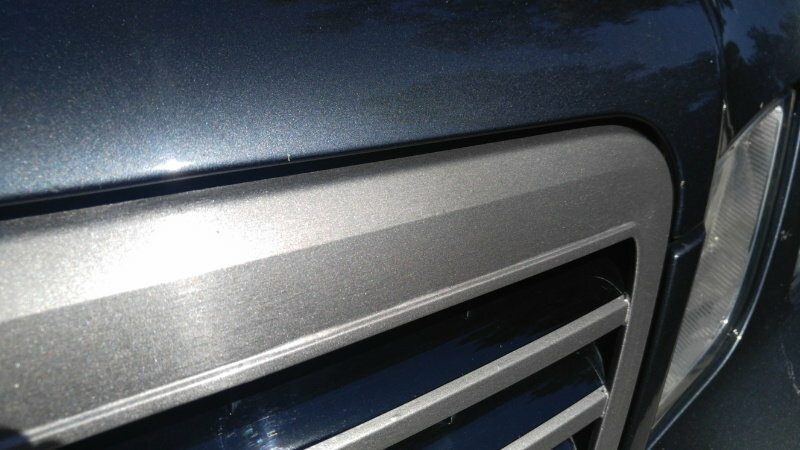 One option is to buy some 1/2" silver pinstripe tape. That will be flexible enough to follow the compound curves along the top arc of the trim, temperature resistant, and hopefully non-glossy enough to cut the glare. My local Autozone and O'Reilly's stocks 1/4" silver, but I think that's probably too narrow. Or some brushed chrome tape if there is such a thing. That would match better. 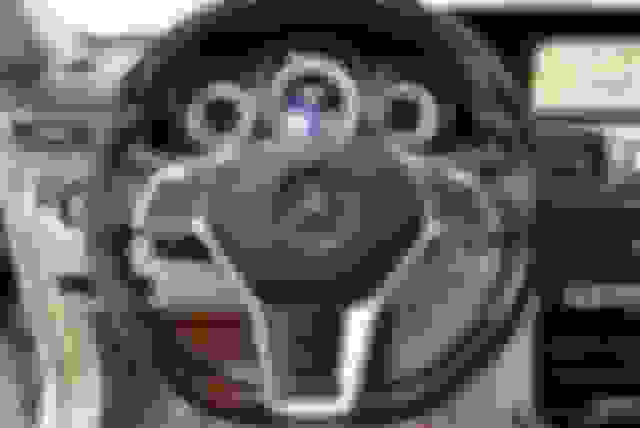 Last edited by DFWdude; 08-01-2018 at 08:09 PM. 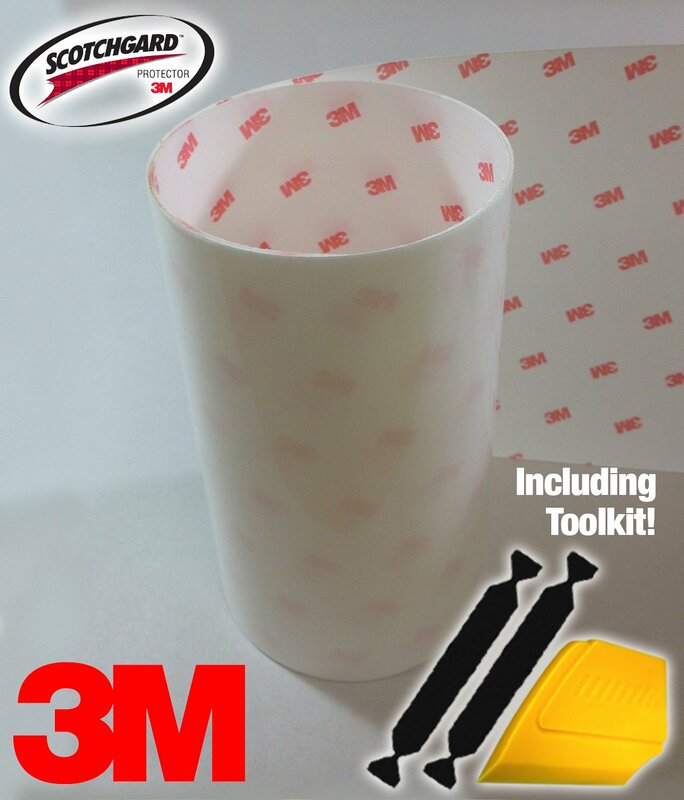 Does anyone have experience with the 3M line of protective films? In particular, are these vinyl films flexible to allow molding around the steering wheel molding, as they seem to be flexible in installation as door edge guards? Thinking about buying some of this VViVID 3m Clear Paint Protection Vinyl film, 4" x 48" With this size, not only would I be able to cut off a 3/4"-1" strip for the steering wheel, but I would have a piece 3" x 48" to shorten and apply to the top of the rear bumper cover to protect the finish when placing items in/out of the trunk. My steering wheel is the same, but the chrome is really not polished. It is a matt finish. Yours does not appear to be a polished chrome either. I have no issue with glare from this steering wheel. Perhaps living in a higher latitude (Chicagoland) the sun is at a lower angle coming through your windshield compared with here in Dallas. The sun is brutal here in the Summer, when the Sun is at Solstice (late June). I agree the wheel has a brushed finish. But it is not matt enough, IMO. I would best describe the glare as similar to what you get if you've ever driven a vehicle with a cracked windshield in the driver's line of sight. The sunlight will create an intense, single point beam of reflected light in the crack (not a broad refelction). Likewise, the dished, brushed chrome curve above the top of the airbag (IMO) acts like a single point reflection concentrater -- like a windshield crack -- dependant on sun angle... if the sun is to the right, the center and left curve will pick up the light. If the sun is to the left, the reflection occurs on the right half of the curve... overhead sun in the middle, etc. I've dealt with reflections on other cars in the past as millisecond glaring distractions. The issue here is that the compound curve catches the light for long periods... Make a turn with the glare present, and it will move along the arc rather than disappear. I hope this better describes it. Last edited by DFWdude; 08-03-2018 at 08:22 AM. I did it myself but you can have a car wrap shop cover it with a vinyl matt flat black. Worked great and to me it even looks more sporty. Both VVid and 3M can conform to contours but you need to gently use a heat gun and a soft edge rule (like the felt edge bondo applicators they sell for this purpose). The 3M got into the compound curves and contours of my grille using this method. Both will do the trick the Vvivid seems blacker but I found the 3M easier for an amature. Buying it in the 12" x 60" sample keeps the cost down. On the steering wheel after 3 failed attempts I made a paper trace of the the wheel. Cut out the places I did't want covered so it was a lot more manageable to work with. I have a MY 2014 (with the big star grill) and want to black out the painted silver sections of the grill. The contours around the star are a lot of stretching and wrinkling. I've tried it with a whole sheet, 6 pieces, and left side, right side. After 4 attempts a nice flat black paint is looking better and better. Also very good to protect the sill plate getting in and out of the car. Very simple to do. Clean the sill, wet it and the film and apply by squeezing out the air and water. It becomes almost invisible. Are you saying that this film works like window tinting, requiring the dawn/water soapy mix and squeegee method, etc. I've worked with window films myself, and am quite meticulous about it. But I don't fancy the idea of getting a watery mess around the electronics in the steering wheel. I may have to try some pinstriping instead. Just measured it. I need 1/2" or 3/4" tape a whopping 8" long, but will probably have to buy 150 feet. So wasteful. Last edited by DFWdude; 08-03-2018 at 10:34 AM. The 3M film I used was applied dry. Heating allows you to stretch it into contours. Last edited by Mud; 08-03-2018 at 10:11 AM. I thought I would need 1/2" pinstripe tape, but after looking from behind the wheel again, I removed the Magic Transparent tape and decided that 1/4" might work. I bought some 1/4" Prostripe Brand Silver Metallic at O'Reilly's. After some fiddling to bend the tape around the compound curve, it is now installed and I think it will work well. Notice the red ellipse in the photo. The Pinstripe (within and to the right) is a slightly duller finish and seems to dampen the glare. Not as dead as the Magic Transparent tape, but it looks better. as you can't really tell it's there from behind the wheel. Time will tell more on a super sunny day. 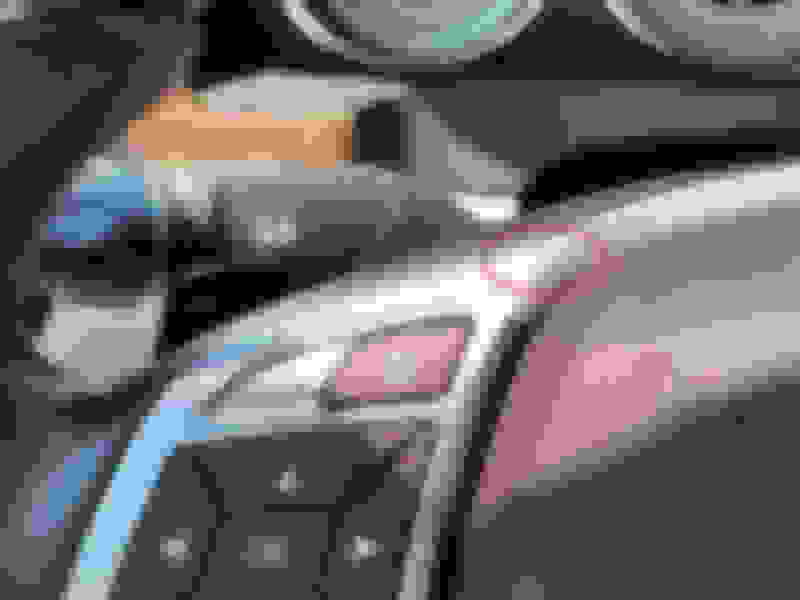 Last edited by DFWdude; 08-03-2018 at 06:25 PM. Where can I buy this lip at?